Is it finally safe to say the 2011 crop was one of the best in recent years? Animal Kingdom was the first to win the Dubai World Cup for America in many years and finished 2nd in the BC Mile. Mucho Macho Man won the Classic. Shackleford won the Met Mile and Clark Handicap. Master of Hounds went on to win a G1 in Dubai and G2 in Istanbul. Brilliant Speed remained pretty competitive throughout the rest of his career up to the 2012 Classic even though he was only able to win the G3 Saranac. Pants On Fire won the Monmouth Cup and Ack Ack. Stay Thirsty went on to win the Travers and Cigar Mile, and run 2nd in the Jockey Club Gold Cup. Derby Kitten won the Ontario Derby. Decisive Moment won a couple of overnight stakes at Calder and Delta Downs. Comma to the Top won the Daytona, Tom Fool and L.A. Handicaps. And then there are the ones that didn’t even run in the Derby. Caleb’s Posse won the BC Dirt Mile and became a favorite amongst sprinters to many. Royal Delta became one of the best mares in recent history winning two BC Distaffs. And a number of other mares marked their stamp…It’s Tricky, Zazu, Turbulent Descent, Plum Pretty, and I’m sure I’m missing someone. I loved the ’07 crop but in terms of productivity and longevity, I can’t remember one as good as 2011. Anyone? very sad to hear the sudden death of young rider Mr. M. Baze and wish his soul rest in peace and God bless his soul, he was a very good young rider and liked his riding very much. Nehro should take the Preakness...Animal Kingdom looks the best at 1 1/2 miles and should take the Belmont. at least Corey Nakatani has better judgement about pace and timings than Lepraoux, i congratulate Mr. Nakatani. you have done very good job. Animal Kingdom win in KD, is not a fluke, it is real, and i study his pedigree very deeply, his sire is a German sire, german sires are as good as French and English sire. i was in Germany for 5 years 45 years ago, so i know horse cultures. i was also in England for 5 years about that time, so i have very good experience about English sires. this years in the kentucky derby very limited horses have capability of staying distances, so the horses came in acoording to their sire's power and good trainer. the owner of Animal Kingdom wrote couple of comments before the derby, he used to own that horse who was beaten by nose by Silver Charm in that Kentucky Derby, Silver Charm skillfully ridden by Garyy Stevens and poorly ridden by jockey Solis that horse who got beat by nose. i lost that race because of Alex Solis poor riding. at later stage Shackleford will be a monster kind of horse, very speedy and lot of stamina, as he grows, he will be more stronger and stronger, Mr. Dale Romans keep on going with Shackleford, you have a terrific horse. now after the derby race i have different opinion on Mineshaft's sieblings, they are good for 1-1/8 miles, they can not stay after 1-3/16 miles, that's why Nehro got beat at the weir. forget about Dialed In, he can not stay aftewr 1-1/8 miles, the Florida Derby was his wake up call , nearly beaten by Shackleford, after Florida derby i study the pedigree of Shackleford and i found he is indeed can stay upto 1-1/4 miles and has got the speed, now in Preakness Stakes i am pretty sure that Animal Kingdom will be unbeatable, his sire from Germany who can stay more than 1-1/2 miles, that's why i picked Animal Kingdom in my trifecta and superfecta, but due to my great mistake believibg in Dialed In, i lost everything, now i can say that Preakness and Belmont Stakes belong to Animal Kingdom, hje has the stamina from his father and mother both, even Bob Baffert horse can not beat animal Kingdom in Belmont Stakes.Jaysito has pedigree that can stay 1-1/2 miles, but he can not beat Animal kingdom. i regard now after seeing Animal Kingdom performance in the kentucky Derby, he has natural capability to guide himself, he is a true speedstar by nature, i made a great mistake by selecting Dialed In No.1 , it was all due to heavy propaganda by his Trainer Nick Zito saying Dialed In is such a great horse that America have ever seen, i believed him and i study Mineshaft very carefully, and came into conclusion that as Mineshaft was very powerful sire and stayed very well 1-1/4 miles, so can his yearling can also stay. that was my only mistake believing that. it was a very bad luck for me. i could have won all this tyrifecta and superfecta if i did not put Dialed In on top of my selections. i listed 6 horses out of 19 horses which was 1.Dialed In 2. Nehro, 3. Mucho Macho Man, 4. Animal Kinghdom,5.Shackleford 6. Master of Hounds. if i boxed in all horses it mioght have cost me over $1000.00 but in return i got huge profit. it was my plan before the derby but when i waggered i change my plan and with 100% confidence i put Dialed In on top and rest i boxed together. it was cost my luck and money. i lost the money on Dialed In and i also lost my trifecta and superfecta! because of 100% believing in Mr. Zito? i did a very stupid mistake believing in Dialed In ? 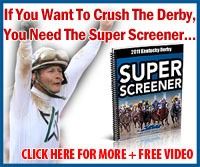 i was so upset on Julien Leparoux today in the Derby that Dialed In lost due to his stupid riding, generally in last 2 derby preps, he allowed 15 lengths to the leaders , to dau in the derby he allowwed 50 lengths, is he crazy??? no horse can win the derby dfistance if he fall nback 50 lengths from the leaders. it is common sense, how could he do that/ he might haver lost his mind. i lost $ 1000.00 and Trifecta and Superfecta due to his stupid riding, i chhose Dialed In on top, then tyhen 4 horses boxed in including Mucho Mucho Man, Master of Hounds, Animal Kingdom ans Shackle ford, it cost me lot of money, shame on Julien Leparoux!!! with Dialed In on a top, i had Animal Kingdom, Nehro, Mucho Macho Man, Shackleford and Master of Hounds were all boxed in for trifecta and superfecta, with the failure of Dialed In, i lost all, i am in the racing field over 45 years and i have lot of experince in pace and fraction of timing, i have never saw in any race through out the world that 50 lengths back from the pace any horse have ever won the race, yes i saw in england in steeple chase race a horse won the race prior to the fall of jockey on the ground and the jockey got back to horse and the horse still won the race, that was a miracle. but not in the throughtbread , that was in steeple chasing . this derby time fractions are not that slow, it was moderarate pace, generally in 1-1/4 mile race 23, 47, 1-12, 1-37, 1-49 and finish 2.02 is common, in this race it is excactly in this time fraction the race was ran. so i do not see any slow pace at all, it was the jockey's judgement error of pace and timings, so i know this was part of my mistake to put lot of money. but the way Dialed In was putb it together the derby prep races, i was sure 100% that he is going to win, i selected 6 horses like Dialed In, Nehro, Mucho Macho Man, Animal Kinghdom, Shackleford and lately Master of Hounds, first i thought i will put in my triafecta all the horse on the top, then Nehro in second place and all the horses in 3rd place, and then all the horses on the top and Dialed In in second place and the all the horses in the 3rd place, that's the way i had plan, but when i came to race , i have changed my plan and being overconfidence on Dialed In , i just put Dialed In on the top and 6 other horses in second place and also 6 other horses in 3rd place, that's the way i waggered the triactor and put straight win on Dialed In and Nehro. but my luck was'nt in my favour, so i lost. what Mr. Zito has to say for his kentucky Derby defeat? He said lot of words about his horse, but come in empty??? sorry and Nehro in my trifecta and superfecta and also just for save side i put $500.00 to win on Nehero. i am wondering Sweet Ducky when ran with Dialed In in the Holly Bull stakes, he came very fast and beaten by 1-1/4 lenngth, but when he ran in UAE Derby he was 10 lenthh behind Master of Hounfds at the finish line, i am now beginingb to understand why aiarish atarainer Mr. O'Brien took interest to run his horse Master of Hounds in the kentucky derby?? Twice the Appeal or Pants on Fire to win! It's a horse race I havent seen in many years, Good Luck. You know who you are:) Rest Now. Big Day tomorrow. this is great..come on friends play! So Zito and Bafford both have horses in the race. Derby party anyone? My family didn't pull through for this event either.